Muffin and I left early as usual, around 4:30 AM. This was to be my second attempt at climbing South Kinsman. An unbroken trail and deteriorating weather had prevented me from making it past North Kinsman on a snowy hike back in March of 2000. 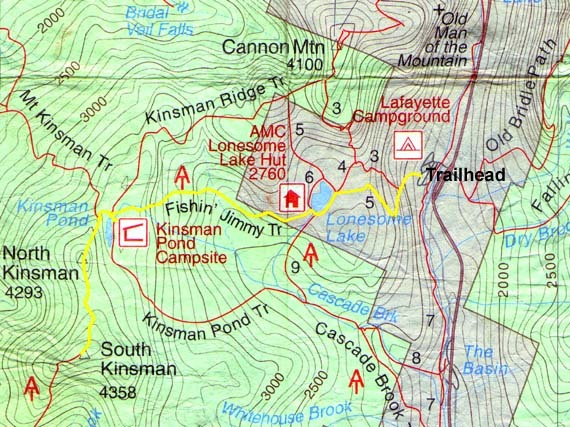 After stopping in Lincoln to check in at home from a pay phone, I parked the car at the Lonesome Lake Trailhead at Lafayette Campground, and we started up the trail around 7:30. Smoke from early morning campfires mingled with the scent of frying bacon, hanging deliciously in the still air. As always, the hike up to Lonesome Lake was fairly easy, but I soon discovered that I had left the bug repellent in the car. I would later regret my decision not to go back and retrieve it; the blackflies weren't bad down this low, but they were murder up higher. I was thankful to pass out of range of the highway noise when we reached the plateau at the top of the last switchback. It took us just over an hour to reach the north shore of the lake. I stopped to take a picture across the lake to the hut, which was hidden in the trees. The weather was perfect and the lake sparkled clear blue in the early morning light. After reaching the south shore of the lake by the hut's dock - which actually isn't really much of a dock at all as it isn't out in the water - I stopped again to take a picture of North Cannonball. I was hoping to get a good picture of the Franconia Range, but the sun was creating too much glare for the camera. 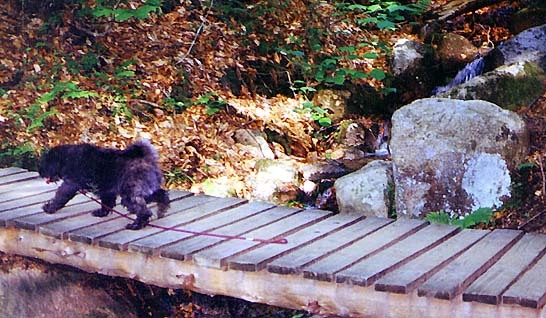 Muffin crossing a small bridge on the Lonesome Lake Trail, just before the Hi-Cannon Trail junction. 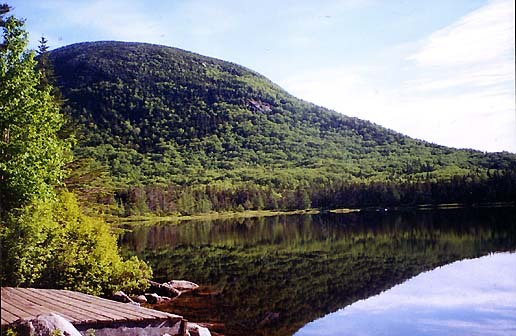 Lonesome Lake and the Kinsmans from the North Shore of the lake. The hut is hidden in the trees at the center of the picture. 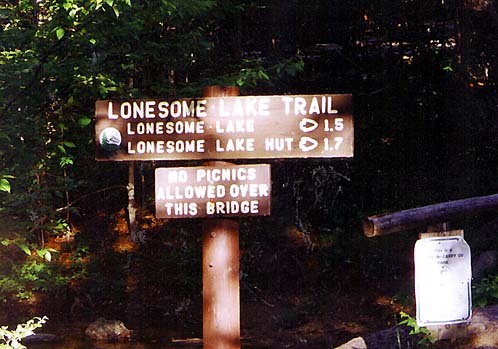 The Around Lonesome Lake Trail. 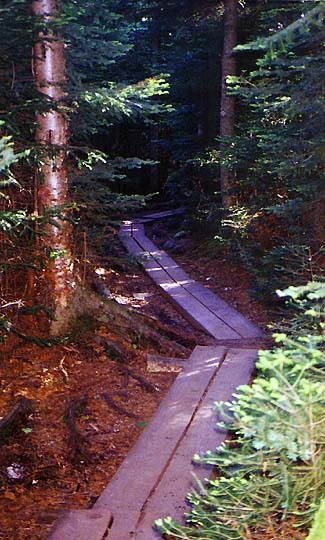 Timber puncheons, are known as bog bridges, cover much of this generally wet trail. North Cannonball from the hut's dock. 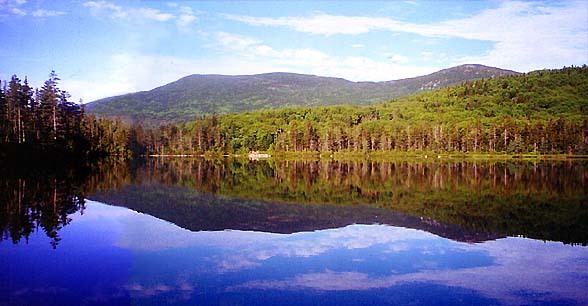 This is a popular place for swimming and for looking across to towering Franconia Ridge in the distance.